Winter is here and in the Northeast this means cold temperatures and lots of snow. Here are some tips to help keep your pets safe when the temperature drops. We are all guilty of sitting around a bit more during the coldest months of the year. Make sure your dog gets plenty of exercise, even if it means playing indoors. When playing outdoors in the snow do not let your dog off leash. 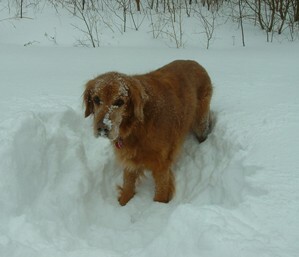 It is easy for dogs to lose their scent in the snow and get lost. Make sure your dog is wearing an ID tag. When you are outside with your pets in the winter watch them for signs of discomfort. 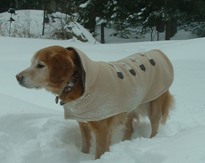 If they whine, shiver, seem anxious or slow down it is time to get them inside and warm. If you are cold then they are probably cold too. Remember most of our animals are accustomed to living indoors. They have not adapted to the cold temperatures. Salt and other chemicals used to treat roads, as well as the bitter cold, can cause irritated, painful paws. This can result in licking, biting and possible cracked, bleeding pads. Your dog will may also ingest salt and other potentially dangerous chemicals. Make sure to wipe off your dogs feet, legs and stomach when he comes inside. Try soaking your pet’s paws in warm water if they appear irritated. Be sure to use pet safe ice melt on your property. Never leave your dog or cat alone in the car. A car can act like a refrigerator in the winter, holding in the cold. An animal that is not used to cold temperatures could freeze to death. Very young and old animals are more vulnerable to the cold. Don’t shave your dog during the winter months. A longer coat will provide more warmth. If you own a short-haired breed consider getting him a coat or sweater to wear outside. When you bathe your dog make sure he is completely dry before taking him out for a walk on those chilly days. Antifreeze is a lethal poison for dogs and cats. Be sure to clean up any spills from your vehicle and consider using products containing propylene glycol instead of ethylene glycol. Keep your cat indoors. Cats who are allowed to roam can become injured, lost or exposed to infectious disease from other animals. During the winter cats often sleep under the hoods of cars. When the motor is started the cat could be injured. If there is an outdoor cat in your neighborhood, bang on the car hood before starting it to allow the animal to escape. Make sure your furry friends have a warm place to sleep that’s off the floor and away from cold drafts. A cozy dog or cat bed should do the trick.